Peter is a Director of Modern Media Publishing and is the publisher for Modern Medicine Magazine. The use of multiple drugs, often termed polypharmacy, is commonly defined as using from five to 10 prescription drugs. This polypharmacy is sometimes necessary but may be associated with an increased risk of adverse outcomes.2 The US Center for Medicare and Medicaid Services estimated the annual costs of polypharmacy at over 50 billion dollars in America. Conventional drug delivery systems are known to provide an immediate release of a drug with little control over where the drug is released or the time period of release. Controlled drug delivery systems offer control over the drug release timing and target site. Osmotic pumps are a promising system for controlled drug delivery. These systems are used for both oral administration and implantation. Laser drilling is one of the most commonly used techniques to create a delivery orifice in the osmotic tablet. 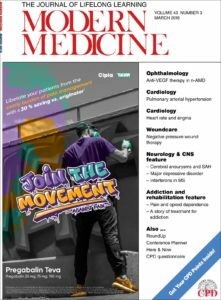 We welcome you to come and read through our latest, April, edition of Modern Medicine. This month we have a jam packed edition for you. 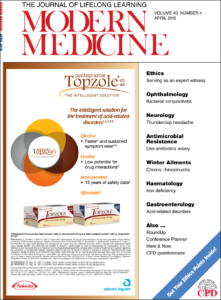 Our features this month include; Opthalmology, Haemotology, Winter Ailment , Neurology and many more. crucial. Referral to a gastroenterologist is often required. Faecal occult blood testing is not recommended. iron is no longer recommended for patients of any age. management. Removal of the adenoids is often helpful in children with chronic rhinosinusitis. imaging with either MRI or CT if each preceding investigation has yielded a normal/negative result. and multifocal, multi-vessel segmental cerebral artery vasoconstriction that usually resolve within 12 weeks. cause conjunctivitis. Bacterial conjunctivitis (BC) can be classified as hyperacute, acute and chronic. We welcome you to come and read through our latest, March, edition of Modern Medicine. This month we have a jam packed edition for you. Our features this month include; Opthalmology, Cardiology, Woundcare, Neurology & CNS and many more.